In this communication, the systematic studies of structural (basic crystal data, microstructure), and electrical (dielectric constant and loss, impedance, modulus, conductivity, etc.) properties of the double perovskite material Bi2MnCdO6 have been reported. The compound has been synthesized by means of a high temperature route (a solid state reaction method). From the X-ray diffraction structural investigation, a stable phase of the orthorhombic crystal system has been recognized. The microstructure obtained from the scanning electron microscope shows uniform, dense and compact grain distribution. Detailed investigation of dielectric as well as electrical parameters of the fabricated compound through a broad frequency range (i.e. 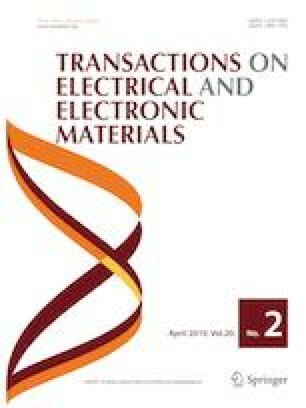 1 kHz–1 MHz) and temperature (i.e., 25 °C to 300 °C) have provided many interesting data and results in order to understand its ferroelectric and electrical relaxation mechanism. It has been experimentally affirm that this material (Bi2MnCdO6) has more advantages like high relative dielectric constant and low tangent loss over Bi2MnCoO6 material.